La Casa Encantada i La Palma, Spanien : Boka nu! 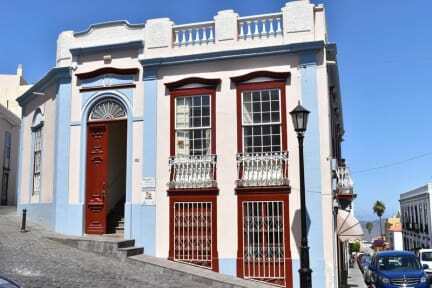 La Casa Encantada is a Hostel with private and shared rooms in a Colonial Era building from the early 20th century, located in the historic quarter of the town El Paso, which lies at the heart of the island La Palma. 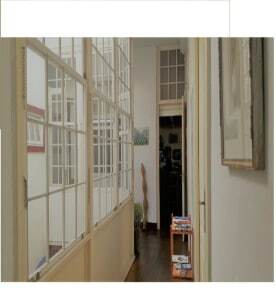 The space comprises five rooms in the same house, four are rented as private rooms. One is a two-bedroom suite with private bathroom where the main room has one double bed and two single beds, and the smaller room of the suite has a single bed. We have a beautiful loft with double bed. The other private room has one double bed and four single beds. The total capacity of the private rooms is 13 people. The shared room is a bigger room that has 9 single beds. The house has three bathrooms, two shared by all the guests and the third is exclusively for the suite guests. Light and art are part of the carefully planned interior design, making the lodgings serene and beautiful. WiFi, bed linens and towels are provided. The common areas are a roomy, comfortable and bright dining and living room with a kitchen for the guests to use and a roof terrace with tables and a parasol. From the roof, guests have excellent views over the town and the landscape of the area. We have a separate reception room. The house lies in the historic quarter of the town El Paso. Basic services are available in town: supermarket, bank, taxi rank, bus stop, medical facilities, restaurants and bars. However, since it is a small town, it is quite peaceful. El Paso sits at the center of the island La Palma, strategically making it easy to visit interesting places on the island, other towns, natural sights and hiking through nature trails in the area.